Wishing everyone good health and lots of happiness this coming year! Love from Len, Parsnip 'the little white peril' and me. I should have mentioned this previously. Although I most likely won't find time to do the draw immediately after 11am tomorrow when the Playground gates close, you shouldn't add your name into any of the prize comments after that time please. If you could see the reams of paper here trying to keep track of who would like to be in for which prizes! In order to keep it fair, and so that I don't have to check times on any last minute comments in what might be a few days time, I'll be disabling comments on all of the nine prizes at 11am tomorrow as well. Do check out today's prize if you haven't done so already! An attempt to show the sparkle on a dull Winter morning! It's a big and bold stamp which I think is just stunning, and so beautifully used and coloured by Kathy - and you can take a closer look over at Kathy's blog here. Thanks for letting me share this Kathy - I owe you as there was no time to even attempt to make a sample, besides which yours is perfect! The Playground gates will be closing very soon, at 11am on Saturday as usual. I am left with one Christmas themed prize - but it's quite a special set of stamps and matching dies so rather than squeeze it in here - it will be on offer from Sunday's new Mr Linky. I think you'll like it - a lot! At the end of all of the celebrations I'll do a massive draw session for all the prizes shown during this celebration, up to and including today, using the one Mr Linky - which is on the main snippets post HERE - so you do need to have entered one snippets make over on that post to be in with a chance :) Maximum of one entry please - to keep things fair for those who may not have had much time to craft. Just leave a comment on this post if you would like the chance to win today's prize, remember there are three sets on offer. He's my much trusted in-house critic but I caught him out with this one. He always finds the most amazing cards to give to me - this year it was a hologram Christmas teddy bear image on the front :) He opened the above card on Christmas morning, raised one eyebrow and said 'Ah, you had to give in I see and buy one'. He held his hands up in surrender when the penny dropped that I'd made it - best result ever! And another prize to add to the pot, I hadn't realised just how many Christmas items I had squirreled away in the Playground toy box! I love Clearly Besotted products and do hope that they swing back into production when the New Year is under way. Stephanie, quite wisely, decided to take a breather for a little while when things were becoming unmanageable. I don't think this stamp set is likely to be available again, although there is a pared down version over at Simon Says Stamp called 'Rockin' Robin 2' - along with the matching dies. At the end of all of the celebrations I'll do a massive draw session for all the prizes using the one Mr Linky - which is on the main snippets post HERE - so you do need to have entered one snippets make over on that post to be in with a chance :) Maximum of one entry please - to keep things fair for those who may not have time to craft. 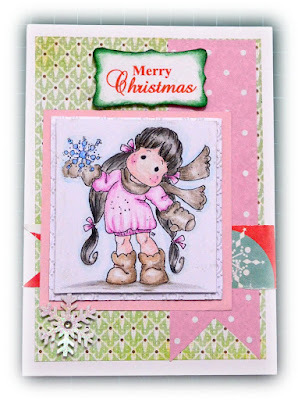 A Penny Black slapstick 'Sweet Snowman' stamp and a Uniko 'Stunning Snowflakes' stamp set. I won't be splitting these as they make a great pairing plus I just worked out how many parcels I'll need to package up and send out once all this is over! And today is the day we (hopefully), slow down a little and take it a bit easier. I love Boxing Day supper - cold turkey, cold pigs in blankets and ham cooked in Coca Cola. Along with bubble and squeak made using leftover potatoes and sprouts with chestnuts, plus a selection of pickles - bliss! It's a Small Bauble 1 stencil and a Small Winter Cabin stamp set from Inkylicious, plus a white Sakura Jelly Roll pen. Merry Christmas everyone! Hope you have a lovely day, however you are spending it, and that Santa was good to you. - as I was in a hurry, there are some things I would perhaps do differently another time but overall I did OK in the time available - there's just so much to choose from! One hint if you're the winner of this prize - keep a little dish handy to pop those tiny dies and die cuts in as you're cutting them! As lots of folk will be 'otherwise occupied' tomorrow, I thought I'd wish you a Very Merry Christmas today from Len, Parsnip and myself in readiness. Remember, if whatever you're fretting over isn't finished for tomorrow - it really doesn't matter. That's my theory and I'm sticking with it! As I said at the time, I'd been after a 'Christmas tree' die made up of words for ages. This one is quite big so you don't really need anything much else on a card - IMHO. It's a Crafts-Too 'Merry Christmas' embossing folder and an Xcut 'Christmas Tree' die. Do remember that to be in the draw for particular prizes you must leave a comment on the specific post related to that prize. Not one, but SIX of these are on offer as prizes - it's the Crafts-Too 'Let It Snow' embossing folder of course. A Creative Expressions 'Let It Snow' die,. of course! Liz is aware that there's a die coming along as a prize which will tax even the most dedicated crafter who fancies 'inlaying' it with all those little cut outs! I was stunned at how well she inlaid the 'Silent Night' die cut from the same range. It's a fabulous die and makes a real statement - but I can't see me ever attempting to inlay it, ever! It's also time for another Cuttlebug Mania Challenge and the theme this time is 'Make a Christmas card - but no red or green'. - plain white card stock for all the layers - I love white pearlescent card but wasn't sure how well the sentiment would stamp - didn't want to risk it smudging! - now I could fathom out spacing for the elements on the card I was ready to roll! 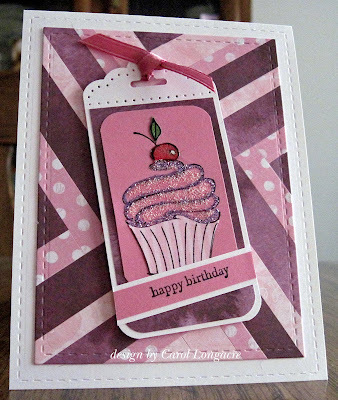 I really loved making this card and was so pleased with a working result! The MFT die cuts and the little 'Spin and Slide Discs' are absolutely brilliant - work so well! Now, I'd spotted the Neighbourhood and the Trees dies being used together by one of you lovely Playmates a good while back - needless to say I can't recall where but thank you for the inspiration! AND, I picked this card, made by Trina, the other week - and that's what really kicked off me buying the slider stuff to go with the other dies. 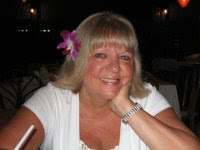 If you go to Trina's blog you'll see some really useful links too! I loved how Trina added a streak of blue to her slider aperture - I was so worried about spoiling mine after all the hard work, I held back! I'm entering this card into the Merry Monday #226 Challenge - 'Winter Fun'. And also into Craftyhazelnut's Christmas Challenge #312 where the theme is 'Cute or Anything Goes' - I think this surely qualifies as cute :). Plus, Craftyhazelnut's Christmas Challenge Extra for December, always 'Anything Goes'. 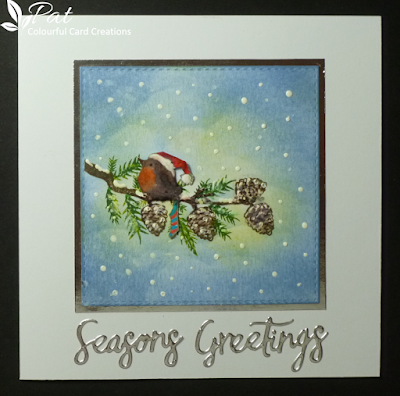 This little robin is one of my very favourite little Penny Black stamps, beautifully added to a branch by Pat. Isn't it sweet? Such a lovely card altogether. 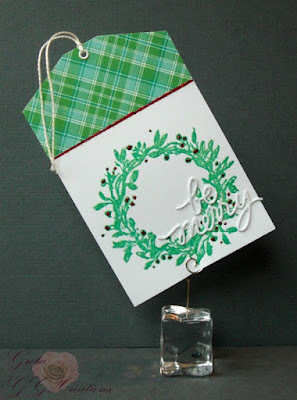 Love the green plaid on this terrific tag, made by Greta! 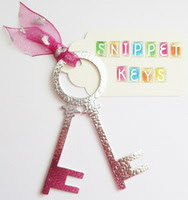 And how perfectly the greens match too - tags are such a lovely way to use up snippets. 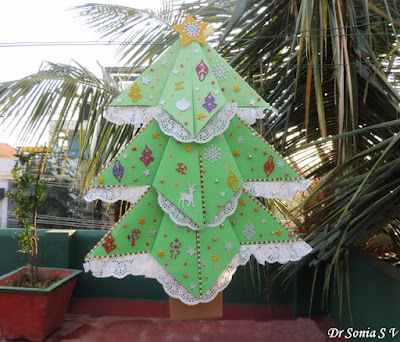 Wowser, what a fabulous and huge Christmas tree Sonia and her daughter Prisha made! To see the scale you really need to hop over to Sonia's blog here - it's origami on a massive scale, with all the decorative elements made using snippets! Sorry, I had to call a halt at four, sigh - as always so hard to choose and so many wonderful ideas. My advice (as always) is to try and find time to visit as many playmates as possible and see for yourself just how clever they all are! Welcome to the Playground Heaney and we hope you come back to play again! Can you please all drop me an email with your address in (this is so that I don't make any mistakes!) and I'll post your prize off as soon as possible! The sooner the better so they don't get too caught up in the Christmas post - and I don't find myself fighting to get at a post box :) My email address is on the right hand side bar. Right, so this is what's going to be going on with the Snippets Playground over the festivities. Not only is it Christmas and New Year (aka Holidays) - it's also a whole five years on 1st January since I took over the Playground from the lovely Jules, so time to celebrate big time! Firstly, the Playground Mr Linky which is below will run for two weeks and closing time will be 11am on Saturday 31st December and this post you are looking at right now is where to add any entries - with a maximum of one entry - over the fortnight. Loads of dithering here about whether to allow more entries but I want to keep things as level as possible. One entry means you're in the draw - and the more prizes you say you'd like to win in the comments in each 'additional prize' post does up the chances quite a bit as I keep a really tight check on those! You have two weeks to play (if you want to of course!) as no doubt the run up to Christmas plus the Christmas and pre-New Year festivities themselves will be busy for you. 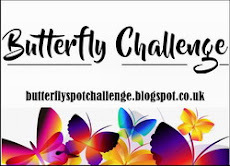 Some of you will be busier than others I know and, for those of you who do find some quiet time to craft, it's a chance for you to play along for some rather nice prizes too. It also means I can clear the Playground toy box out of Christmas themed prizes. Also, just saying here 'count me in for all prizes that are offered' doesn't count I'm afraid and will mean you don't go into the draw at all - other people are taking the time and trouble to check out the individual posts and prizes and leave comments so it wouldn't be fair to them. Again, this worked fine last year. As there will be a good few prizes (for example, I again have six of one particular prize which will appear in one post - got a bit carried away there!) - I think the odds of winning something could be in your favour! Plus, the prizes aren't 'First, Second, Third' etc - some are higher in value than others for sure though - so if your name pops out again you could very well end up winning more than one prize. I hope this is clear girls? Remember, I'm pacing things as best I can over the holidays so I might not manage to comment immediately - ha, probably will be beavering away here making sample cards for the prizes! Cheery Lynn 'Winters Neighbourhood Border' die, Impressions Obsession 'Evergreen Tree' dies, Lawn Fawn 'Winter Bunny' stamp and matching die. Plus, a MFT 'Surf and Turf' slider die set as well as two packets of the super little 'Spin and Slide Discs'. 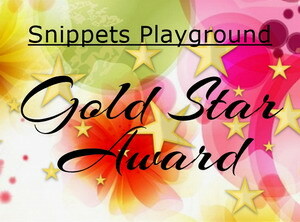 The Snippets Challenge will run for two weeks and the Playground gates will close at 11am UK time on Saturday 31st December. As we'll be right on top of New Year there will be a new Mr Linky on Sunday 1st January 2017 and probably the picks but the results of the huge raffle/prize draw may have to wait until during that first week of January 2017. Maximum of one entry and please say in a comment if you wish to play and be a possible winner of the prizes. Remember, there's the prize today and others will appear fairly frequently over the next two weeks so keep your eyes peeled. Do say in this post if you only want one or other parts of the prize today but it's all up for grabs as one prize of course and will only be split if the first name out only wants one or other of the items, in which case I'll do a second or further draws for the other part(s) of the prize. And please also remember to link back to the Playground in your blog post to be eligible for the draw.